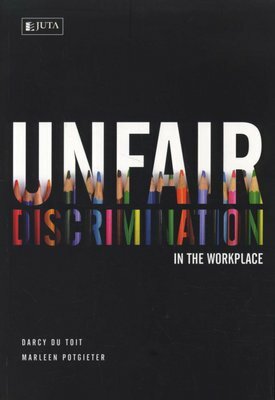 Unfair Discrimination in the Workplace cogently explains the meaning of unfair discrimination and the law on harassment and medical, HIV and psychological testing. 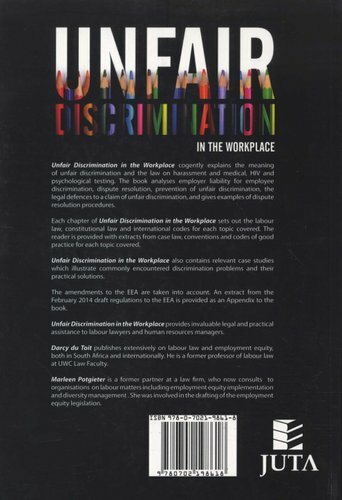 The book analyses employer liability for employee discrimination, dispute resolution, prevention of unfair discrimination, the legal defences to a claim of unfair discrimination, and gives examples of dispute resolution procedures. Chapters set out the labour law, constitutional law and international codes for each topic covered in the book. The reader is provided with extracts from case law, conventions and codes of good practice grouped with each type of unfair discrimination. Unfair Discrimination in the Workplace also contains relevant case studies which illustrate commonly encountered discrimination problems and their practical solutions. The amendments to the EEA are taken into account. An extract from the February 2014 draft regulations to the EEA is provided as an Appendix to the book.